Practicing Relativism in the Anthropocene. Cover. Smith, Barbara Herrnstein. 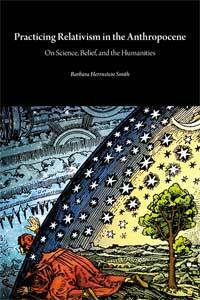 Practicing Relativism in the Anthropocene: On Science, Belief, and the Humanities. London: Open Humanities Press, 2018. Barbara Herrnstein Smith addresses a set of contemporary issues involving knowledge and science from a constructivist-pragmatist perspective often labeled “relativism.” Practicing that relativism, she argues, does not mean refusing judgment or asserting absurdities but being conscious of the existence and significance of contingency, complexity, and multiplicity. © Barbara Herrnstein Smith, 2018. This book is licensed CC BY-SA 4.0. The Critical Climate Change series addresses the current sense of depletion, decay, mutation, and exhaustion which calls for new modes of address, new styles of publishing and authoring, and new formats and speeds of distribution. Edited by Tom Cohen and Claire Colebrook, the series aims to publish, in a timely fashion, experimental monographs that redefine the boundaries of disciplinary fields, rhetorical invasions, the interface of conceptual and scientific languages, and geomorphic and geopolitical interventions. Emmett, Robert, and Thomas Lekan, eds. "Whose Anthropocene? Revisiting Dipesh Chakrabarty’s 'Four Theses,' "RCC Perspectives: Transformations in Environment and Society 2016, no. 2. doi.org/10.5282/rcc/7421.